The next road trip needs brain teasers: great state sights, facts and a word search on every geography printable. Check out Mississippi Fun Facts! Every geography worksheet should come with a word search and fun puzzles. Check out North Carolina! This Illinois Fun Facts page features fun brain teasers, great state sights, facts, and a word search. A perfect companion for any road trip! Drawing faces can be tricky, even for grown-ups! Fortunately, this worksheet shows how to use simple maths concepts to draw a pretty picture of a person's face. The next road trip needs brain teasers like these geography worksheets. Check out Alabama fun facts! This Iowa Fun Facts page features fun brain teasers, great state sights, facts, and a word search. A perfect companion for any road trip! This memory game also involves coloring! Your child will get to practise memorizing by trying to re-draw the missing parts of these pictures. This Indiana Fun Facts page features fun brain teasers, great state sights, facts, and a word search. A perfect companion for any road trip! This Maryland Fun Facts page features fun brain teasers, great state sights, facts, and a word search. A perfect companion for any road trip! The next road trip needs brain teasers like these, with great U.S. state sights, facts and a word search on every geography worksheet. Check out Ohio Fun Facts! With a trip to the great outdoors usually comes some travelling - feed the kids' excitement and keep them from boredom on the way with a camping word search! Like a visual treasure hunt, City Bingo is a fun alternative to I Spy. Your kindergartener will love searching for the items on her bingo card. 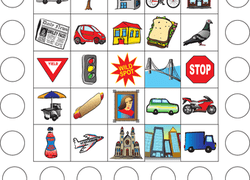 The next road trip needs brain teasers like these, with great U.S. state sights, facts and a word search on every geography worksheet. Check out West Virginia! Learn all about South Carolina with this fun facts page. Kids will do a word search, coloring activity, and more in this South Carolina worksheet.